“In That Instant, Your Billboard Careened Ashore On A Wall Of Water, Cracking The Back Of My Head. I Reached For Balance And Touched What I Thought Was A Puppy. Then You Grabbed My Finger. My God, I Thought. It's A Baby. I Fainted Dead Away. That's How Macon Found Us The Next Day - Me Unconscious On Half A Billboard, You Nestled In My Arms, Nursing On The Pocket Of My Uniform. The Half Billboard Said: " ... Cafe ... Proprietor." Our Path Seemed Clear. 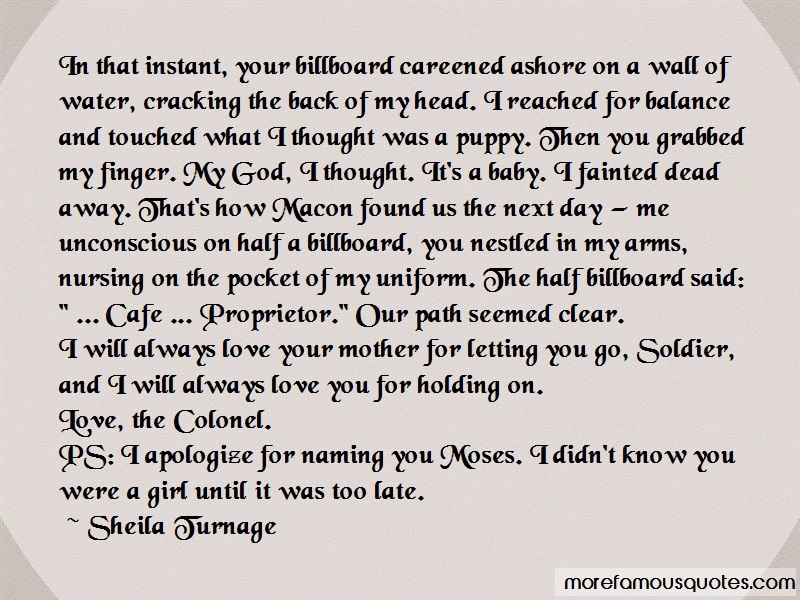 I Will Always Love Your Mother For Letting You Go, Soldier, And I Will Always Love You For Holding On.